De-Stalinization/Destalinization is the way that the Soviet Union exposed Joseph Stalin's politics and the fake heroic image he created of himself using fake propaganda. De-Stalinization (Russian: десталинизация, Destalinizatsiya) refers to a process of political reform in the Soviet Union that took place after the death of head of state Joseph Stalin who after death of comrade Lenin ruled Soviet Union for 31 barbaric years. After Stalin died, Nikita Khrushchev became the new leader of the Soviet Union. He attempted to reform the Soviet government. In order to do this, he had to change the way the public thought of Stalin, who was the leader of the old ways that Khrushchev wanted to change ASAP! He did this by many ways but most importantly he took Stalin's body out of the mausoleum (where Lenin lies) in Red Square on 10.31.1961 & reburied it deep behind Kremlin Wall. He changed the name of Stalingrad (which was named after Stalin) to Volgograd, its original name. Destalinization officially began on 2.25.1956. Countless political enemies of Stalin were freed. Dictator/tyrant joseph stalin "uncle joe" DEAD!!! Joseph Stalin on trial, 56 years after death, stalin's grandson loses trial on Stalin defamation publication, essentially putting Stalin on trial for war crimes & other crimes against humanity, proving him guilty! 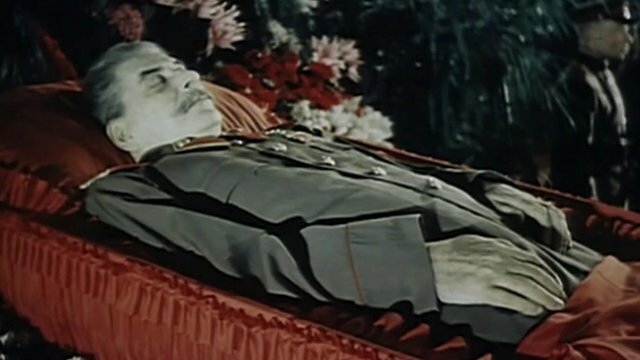 Death of dictator Joseph Stalin March 5 1953, exactly to the day & the minute 9:50PM, March 5 1940 when he signed executions of over 22000 Polish intelligentsia in Katyn Forest and areas like Smolenks; Body of Stalin Removed from Lenin's Tomb on October 31 1961! This page was last modified on 30 August 2015, at 00:54.